We had some new friends over to see our house and some of my work. 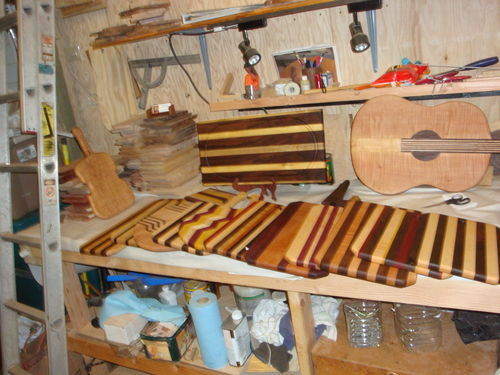 My wife plays music with them and the guy makes mandolins. They wanted to see what i am making. So I took the opportunity to start getting my act together for the first show of the year- next month. I am building new shelves out of Black Oak. The original fir was pretty ratty- think duck tape in places. I put my new boxes out and set up my cutting board rack. Here are some photos. Can’t do the same thing twice! Some I have done in a similar style, but different woods. 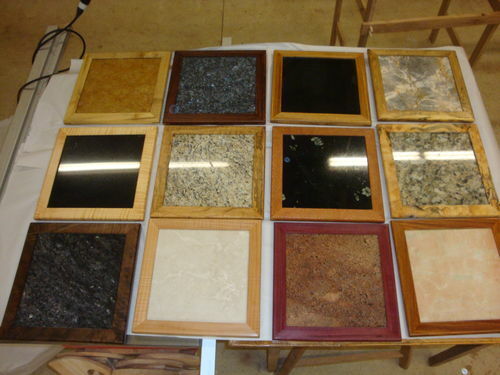 I also made some tile trivets. After I put everything back into clean boxes, I cleaned and put a coat of spar urethane on the scratched and nicked rack. 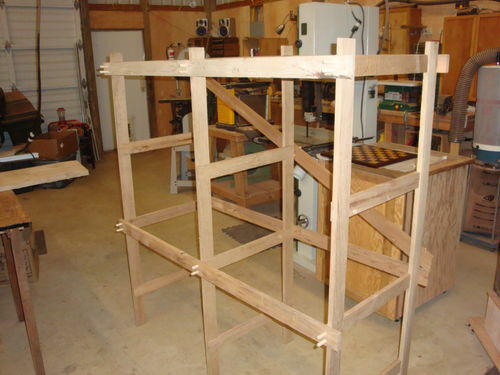 Now I have to make new covered shelves for the shelf frames. I haven’t looked at my canopy. I will have to set it up and see what it looks like. I also renewed my craft insurance with ACT. I got 500 new business cards with my new address, etc. Didn’t do any shows last year while I was moving and getting a new shop together. I did do 2 shows in Oregon in 2013 and they were ok. Good thing I am retired. I have one show each in March, April, and May. Then I am going to try for 2 shows each month during the summer and into the Fall. I am going to miss the crowds at Lake Tahoe, but hope that Oregon will be a good place to sell. Maybe try the more expensive shows in the north part of the state next year. Very healthy inventory. I am sure you will do well at the shows. I like the trivets out of tile that you made. You just gave me an idea or two! That table of boxes—I counted 27—would take me forever to build! LOL Have a great, new show year. You seem to be set now. Nice collection. Very nice inventory, and looks like something for everyone. You have moved up to a great wood hunting area. We make a trip or two to Portland, a year to see grandkids, and I never go home without a nice load of lumber. New shop and new tools look great. Hope you do well in new area. Robert, you make some very nice things and have a wonderful selection. I know that you will do very well. You have been busy! Nice display. You shouldn’t have any trouble selling all of that cool stuff. If you run out of boxes, let me know. I’ve got plenty! Good luck at the shows. Thanks everyone. 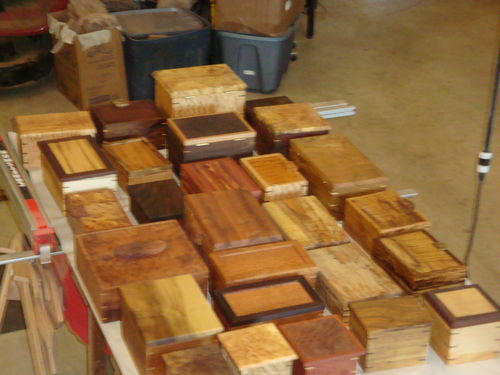 I have 8 more, bigger, jewelry boxes boxes, but the photos didn’t load. I gave up on trying. Doing shows takes a lot of preparation. I also have to get the 20’ rv trailer ready. I do like doing shows. 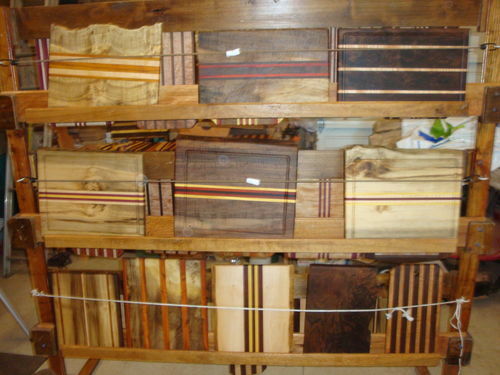 I get to meet other wood workers, and have met wood sellers. I have also been given wood by people. 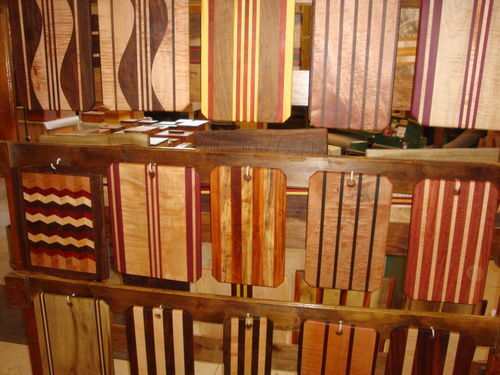 As others have noted, sometimes I am just doing an ART SHOW for lookers, but I have made and sold a lot of boxes and cutting boards over the last 8 years. Andy, I AM NOT going to put your boxes next to mine at a show. People would buy yours and ask what happened to my skill with the others. Besides you live a long ways away! 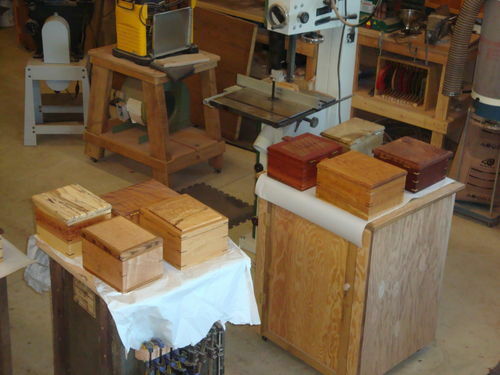 I think I take about 4-5 hours to make a box when I do them 10-12 at a time to save on tool set-up. So the 34 boxes I have represent a lot of time over a few months.